197 x 138 x 335 in.Merkur Einkaufszentrum, Wiener Neustadt (Austria)The title alludes to what happens in the surroundings, an everyday scene from the customer parking lot of a supermarket chain. The work, consisting of 200 dolls with movable limbs, forms a couple, two figures that blend together, navigating through the landscape and on the lookout. 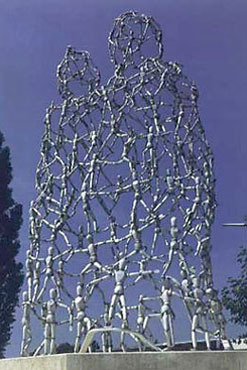 They are symbolic of a joint existential struggle in a very primal sense.